"Beneficial insects" are familiar to organic gardeners. Although "beneficial" typically means pest control, it also includes pollinators. But which vegetables really NEED pollinators? Squashes, for one. And squash bees do the job... Even in small backyard patches! What about tomatoes and peppers? Some would argue the wind is sufficient (to agitate the flowers). 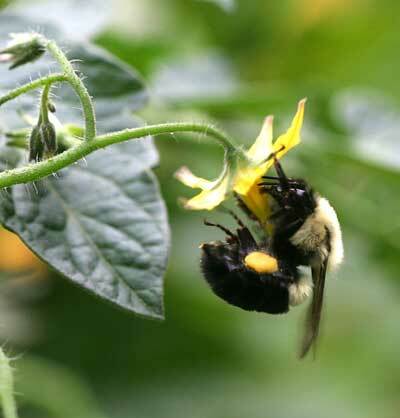 Actually, tomatoes and peppers are much better when animal-pollinated, and specifically "buzzed" by a competent bee. Bumblebees are perfect for this job! The problem is, bumblebees won't "find" your tomatoes and peppers the same way squash bees find your squash. So how to we attract them? The best way is to have the right perennial flowers, close to the garden. Plant mints, clover, Salvia, Monarda, or plants in the Asteraceae (sunflower) family! Check out Appendix B of Conserving Bumble Bees by the Xerces Society for a solid list. If you want to go further, provide nesting habitat for bumblebees. According to Xerces Society, un-mown native bunch grasses, brush piles, and dead trees are best. Basically any place a mouse might find appealing would be attractive to bumblebees, too. Most experts don't recommend putting out nest boxes for bumble bees in backyards (they rarely work), but I think this bird box idea has promise. I write more about bumble bees here. For more info and links, check out this great article at Mother Nature Network from last summer.